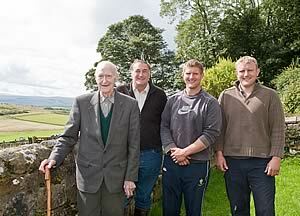 Three generations of the Murray family - left to right, Alastair, Angus, Andrew and Jamie at Sewing Shields. 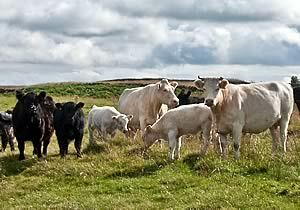 Whitebred Shorthorn and Galloway cows and calves near the line of Hadrian's Wall. Today’s herd of 65 Galloway females, the majority of which are registered, have been bred from a herd of 40 cattle bought from the Isle of Mull, along with purchases of individual animals. The small Sewingshields Whitebred Shorthorn herd was re-stocked with heifers from Allensgreen and High Thorn. 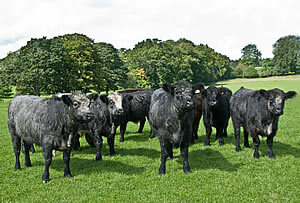 Blue Grey and Galloway bullocks on land at Newbrough. 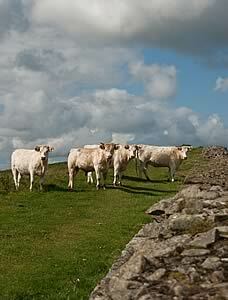 Whitebred Shorthorn heifers and a young bull at Sewing Sheilds Crag on Hadrian's Wall. Angus Murray is chairman of the recently-formed Blue Grey Group who is working with Karen Telford of Hole O’Lyne, to gain status for the Blue Grey which, in turn, would help to promote its parent stock, the Galloway dam and the Whitebred Shorthorn sire. 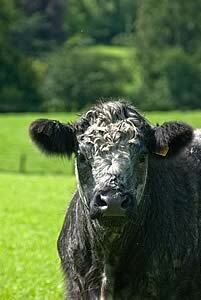 A batch of bullocks was sold in mid August at Longtown, making between £870 to £950 a head. Buildings on the 100 acres enabled the bullocks to be wintered inside on silage.